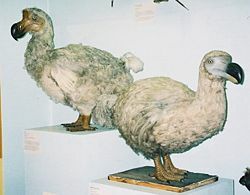 The Mauritius Dodo (Raphus cucullatus, called Didus ineptus by Linnaeus), more commonly just Dodo, was a meter-high, flightless bird native only to the island of Mauritius, located in the Indian Ocean to the east of Africa. The dodo, now extinct, lived on fruit and nested on the ground. Extinction is a natural part of the history of life, and some researchers speculate that natural causes provided the tipping point for the dodo's extinction. However, human activities also played a role, particularly through the introduction of new species to the island, habitat destruction, and overhunting. While this impact may have been largely an inadvertent byproduct of human migration to Mauritius, moreso than the overhunting seen in the case of the passenger pigeon, it does reflect the importance of considering all actions carefully. The dodo had been in existence for many thousands, perhaps millions of years, but was wiped out in a matter of decades. The origin of the word "dodo" is controversial. The name may be related to the Dutch word "dodaars", a water bird known in English as the Little Grebe or Dabchick. Little Grebes are extant, or still living, but they resemble the dodo in that they have similar feathers on the hind end and are also clumsy walkers. Whether the dodo was named after this bird is uncertain, but the Dutch are known to have called the bird the "walgvogel" ("ghastly bird") in reference to the way it tasted. Adding to the mystery of where the dodo's name came from is the fact that "dodo" has been part of the English language since at least 1628, and the Dutch are not thought to have reached Mauritius before 1638. According to The Barnhart Concise Dictionary of Etymology, "dodo" comes from Portuguese doudo (more commonly doido currently) meaning "fool", or, as an adjective, "crazy." The Portuguese word doudo or doido may itself be a loanword from Old English (cp. English "dolt"). Yet another possibility, as author David Quammen noted in his book The Song of the Dodo, is "that 'dodo' was an onomatopoeic approximation of the bird's own call, a two-note pigeony sound like 'doo-doo'." In October 2005, Dutch and Mauritian researchers found a cache of 2,000-year-old bones from about 20 dodos in Mauritius. These findings were made public in December 2005 by Naturalis, the Netherlands scientific institute in Leiden. The discovery was significant because of the scarcity of specimens today. The last complete stuffed bird burned in a fire at Oxford's Ashmolean Museum in 1755. As of 2006, no complete skeleton has ever been found. Though no whole specimens are preserved, a number of museum collections contain dodo skeletons that are composites, made up of the bones of different birds. 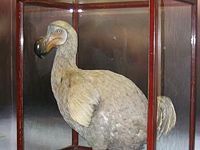 A dodo egg is on display at the East London[ Museum in South Africa. The most complete remains of a single dodo are a head and foot, on display at the Oxford Museum of Natural History. Analysis of genetic material recovered from this specimen revealed that the dodo was a member of the pigeon family and its closest living relative is likely the Nicobar pigeon (Caloenas nicobarica) from the Nicobar Islands and nearby Southeast Asia (Shapiro 2002). Seventeenth-century paintings and drawings of birds brought back to Europe by travelers show the dodo had blue-gray plumage, a 23-centimeter (9-inch) blackish hooked bill with a reddish point, stout yellow legs, a tuft of curly feathers high on its rear end, and stubby wings. Dodos were large birds, weighing about 23 kg (50 pounds). Like penguins, dodos did not use their short wings to fly. The breastbone was too small to support the large pectoral muscles that would have been required for flight. Scientists believe dodos evolved from a bird capable of flying that landed on Mauritius. Given the island ecology, with no predators and plenty of food, the dodo's ancestor would not need to fly, and eventually, it is speculated, the flightless Dodo evolved. The traditional image of the dodo is of a fat, clumsy bird, but Andrew Kitchener, a biologist at the Royal Museum of Scotland, argues that the birds were actually lithe and athletic (Kitchener 1993). He maintains that artists' renditions showed overfed, captive specimens. As Mauritius has marked dry and wet seasons, the dodo probably fattened itself on ripe fruits at the end of the wet season to survive the dry season when food was scarce. With food readily available in captivity, Kitchener proposes that the birds fattened up by gorging on an unrestricted diet. The source of the dodo's extinction is not certain, but researchers believe it may have been a natural disaster or human impact, or some combination of the two. Scientists from the Dodo Research Program announced in 2006, that they found evidence suggesting a natural disaster, such as a cyclone or flood, nearly wiped out the species before humans arrived on the island, reducing its population so severely that it fell below sustainable levels. Whether or not the dodo population was already reduced, humans did contribute to its demise. As with many animals evolving in isolation from significant predators, the dodo did not fear people. This fearlessness combined with its inability to fly made it easy prey. Though the island was first visited by the Portuguese in about 1505, the Dutch were the first permanent settlers on the island. When the Dutch settled Mauritius around 1644, they brought with them sheep, dogs, pigs, rats, and monkeys, which had not existed on the island before. These animals plundered the dodo's nests, while humans destroyed the forests where they made their homes and found food. The last known dodo was killed less than a century after the species' discovery, but some controversy surrounds the exact extinction date of the Dodo. 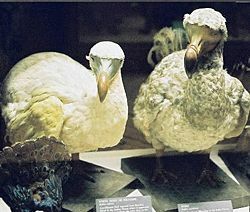 The generally accepted date of extinction is 1662, when a shipwrecked sailer named Volkert Evertsz (or Evertszoon) reported seeing a small population of dodos on an islet off Mauritius (Cheke 1987). Some scientists have pointed out that the sighting was in 1638—24 years earlier—and suggested that the bird may have survived until 1690, but gone unseen because the species became increasingly rare (Roberts 2003). Another group of scientists took into account the hunting records of a Mauritian, Isaac Joan Lamotius, who listed dodos among the game killed by his hunting parties on 12 separate occasions between 1685 and 1688 (Hume 2004). Statistical analysis of the hunting records and previous sitings provided an estimated extinction date of 1693, with a 95 percent confidence interval of 1688 to 1715. The dodo's significance as one of the best-known extinct animals and its singular appearance has led to its widespread use in literature and popular culture. The public's fascination with the bird is often attributed to its appearance in Lewis Carroll's Alice's Adventures in Wonderland (1865). With the popularity of the book, the dodo became perhaps the best-known extinct animal and "dead as a Dodo" became a household phrase. The dodo rampant appears on the Coat of Arms of Mauritius. Barnhart, R. K. 1995. The Barnhart Concise Dictionary of Etymology. New York: HarperCollins Publishers, Inc.
Kitchener, A. 1993. Justice at last for the dodo. New Scientist. 139:24–7. Roberts, D. L., and A. R. Solow. 2003. When did the dodo become extinct? Nature 426:245. Shapiro, B., et al. 2002. Flight of the Dodo. Science. 295(5560):1683. This page was last modified on 3 April 2008, at 19:51.